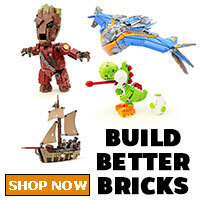 Last month, LEGO officially announced the LEGO Disney Collectible Minifigures (71012) and a majority of the LEGO community as well as the rest of the world went bananas. 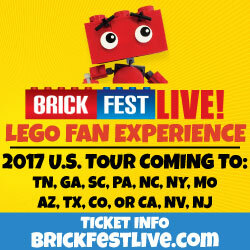 They were rumored last year on April Fools Day but may people dispelled as just that since people can’t really trust anything said on that day. The rumor ended up to be true and here we are now. 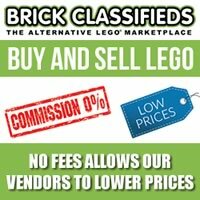 Instead to the usual 16 minifigures that we’ve been used to getting in the past, the LEGO Disney Collectible Minifigures consist of 18 different characters from various Disney franchises and movies including Aladdin, Alice in Wonderland, Peter Pan, The Incredibles, The Little Mermaid, and Toy Story. The blue packaging is synonymous with the coloring that is seen in the opening sequences of movies and shows made by Disney so that is a perfect choice for the color package. 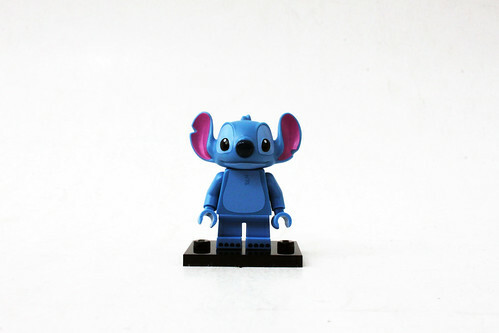 One of my favorite Disney Collectible Minifigures is Stitch, aka Experiment 626, from the hit movie Lilo & Stitch. 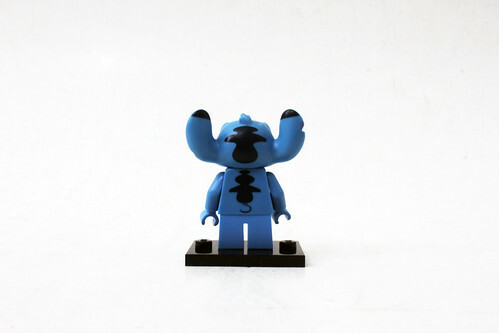 The torso and legs have a two-tone blue color scheme and even the feet has printing for his toes. There is also some more detailing on the back torso and head. The head mold is, in my opinion, the best molded head from this series. I do wish that he had an open mouth expression instead of the closed mouth one that we have here. 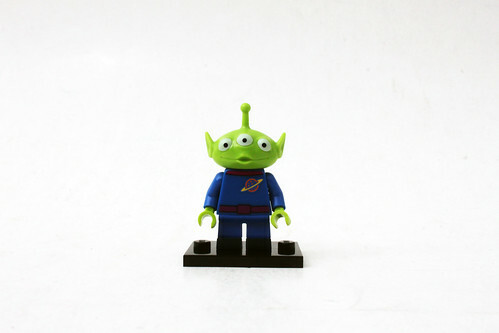 The Squeeze Toy Alien, aka Little Green Men (LGMs), from the Toy Story franchise makes its return to LEGO in this set. 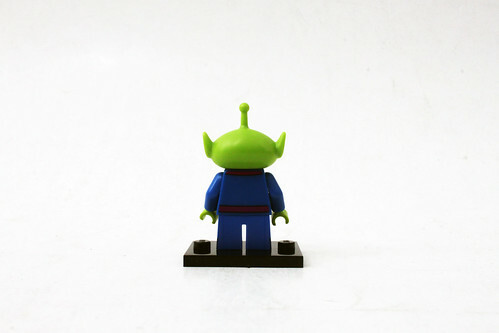 For those who collected the LEGO Toy Story sets, you’ll be glad to know that this Alien is brand new with slightly different printing. The torso is still blue while the planet logo has been slightly updated. The collar is now pink and the belt is purple with a little bit more detailing. There are now boot printing on legs. The head mold is still the same however the pupils on the eyes have different locations as before. 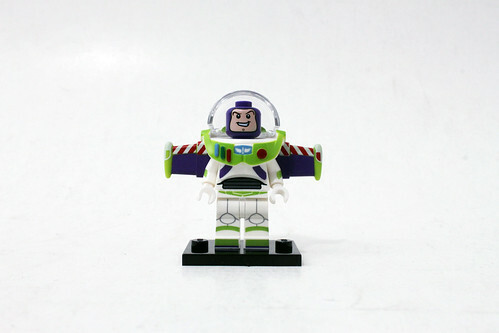 When people saw the image of the Buzz minifigure, there was a slight mixed reaction since we’ve already had a Buzz Lightyear minifigure with the LEGO Toy Story line. 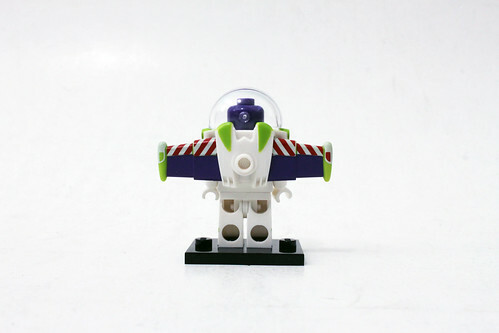 However that version of Buzz had a molded head while this version is a normal minifigure head. The torso and legs have updated printing for the spacesuit. If you look on his right arm, you can see red printing for the laser button. The half bubble sun helmet looks to be the same piece as before. 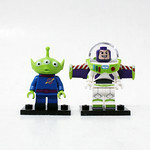 For those who missed out on the last LEGO Toy Story line, this is a great chance to pick up the Buzz Lightyear minifigure. 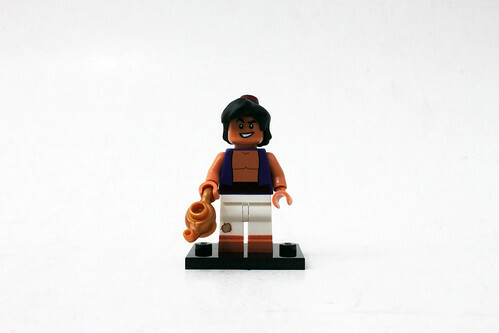 The minifigure for Aladdin is pretty accurate to the on-screen counterpart. The torso has printing of his purple sleeveless vest and the maroon wrap around the waist. The legs have printing of the patch on his white baggy pants and shoeless feet. The facial expression is good with his slightly cocky expression. The hair and fez is actually one mold. 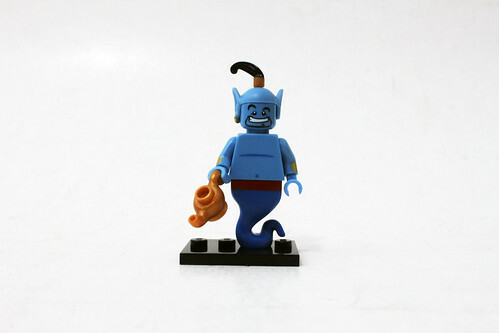 His accessory is Genie’s lamp which isn’t a bad choice but it is also the same piece with the Genie minifigure which I’ll get to shortly. I would have preferred his monkey sidekick Abu as an accessory. 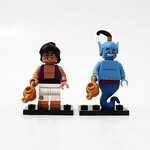 Next up is the Genie also from Aladdin. The torso is mostly blue which is nothing too spectacular but the wrists do have printing for the gold cuffs. 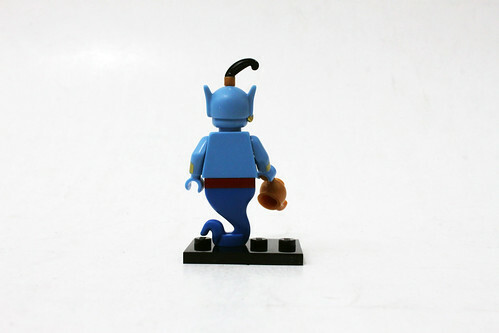 The “leg” piece is the same misty tail one that we’ve seen other genie minifigures have before. The upper part of it has his red waistband while the rest is a nice dark blue. The facial printing on the head, however, is mediocre. It just can’t fully capture Genie’s face without it being a molded head since he has an elongated mouth. It is kind of shown off with the beard printing being a little wide but it doesn’t capture the essence of it. Finally, he has a black ponytail with a gold bead that holds it up. If you look closely at the right ear, you can see that it has an earring on it. 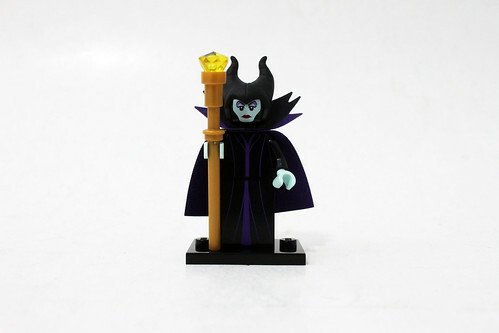 Maleficent from Sleeping Beauty is one of the minifigures that wowed a lot of people when images of the set was revealed. 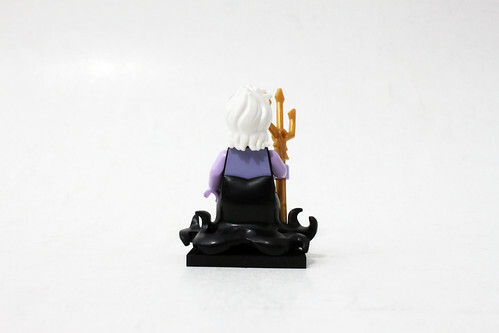 She has the black and purple cloak with the legs being the usual slope piece for the lower part of the body. She also has two cape pieces to finish off her cloak which are both two-colored. Her skin color is a light mint color with the face printing having her eye shadow and a stone-faced expression. She also wears a cool rubber horned headdress. Her accessory is the golden staff/scepter with a gold jewel on top. As you can see, Alice is in her signature blue dress with the white apron printing that also goes on the back of the torso. The lower part of the dress is a new skirt piece. The legs has printing of the black shoes she wears. Her hair piece is a new one with the black bow on top. Her accessories include the “Eat Me” cake and the “Drink Me” potion that makes her grow and shrink, respectively. 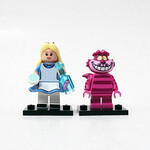 The Cheshire Cat is the other minifigure in this set from the Alice in Wonderland franchise. 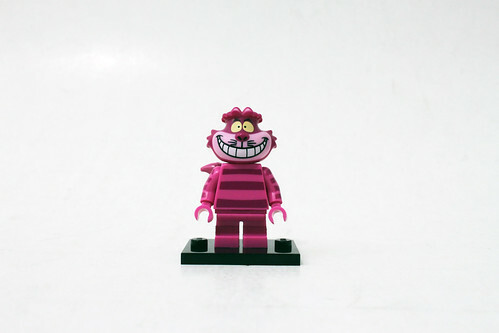 The torso and legs has the pink and purple color scheme that he has his fur. The striped printing are also on both arms. 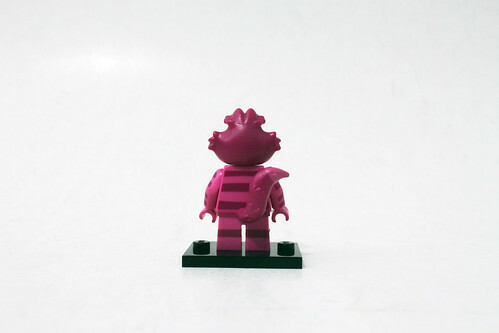 The tail piece mold is the same as from the Rocket Raccoon minifigure but in pink. The head mold is absolutely spot on with the shape and the permanent smile that he has. 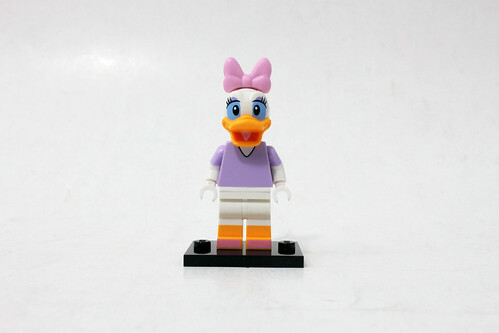 Daisy is a pretty simple minifigure. She has a lavender colored torso that can be useful for something else. The legs are similar with the top half being the lower part of the duck while the feet are yellow with some pink printing for the shoes. She even has a new tail piece with is a nice addition. Her head mold has an open mouth expression. She does have some lavender eye shadow above the eyes. Finally, Daisy also wears the pink bow that attaches to the top of the head. 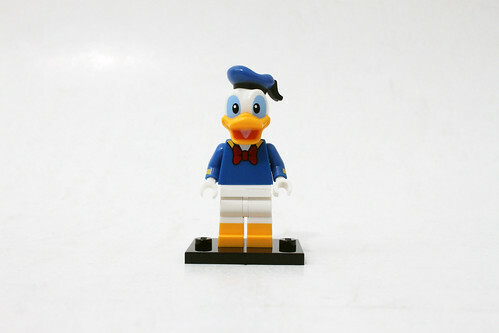 Next up is Donald Duck and the minifigure is one of the few in this set that is definitely 100% representation of the character. He has his usual blue sailor suit with the red bow printing as well as yellow lining on the sleeves. The legs are mostly white with his lower duck body and yellow feet. 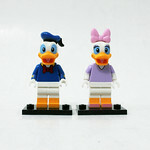 Donald also has the short tail piece to complete the minifigure. The head piece mold is the same as Daisy but with a slighly different printing. The blue hat attaches to the hole on top of the head. 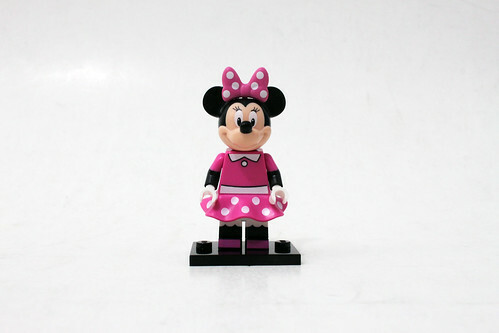 This version of Minnie Mouse is from the Mickey Mouse Clubhouse television series. She wears a pink dress with white polka dots on the skirt part similar to the one Alice has. The legs have printing for the white bloomers and pink shoes. 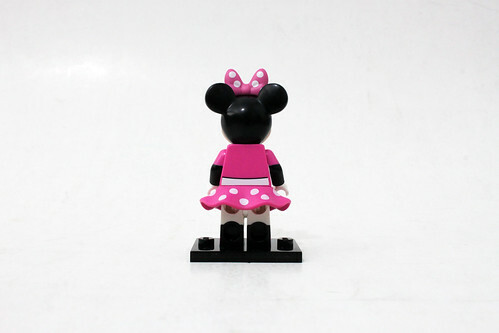 The head piece is has some eyelash printing for Minnie and a pink bow that attaches to the head mold. 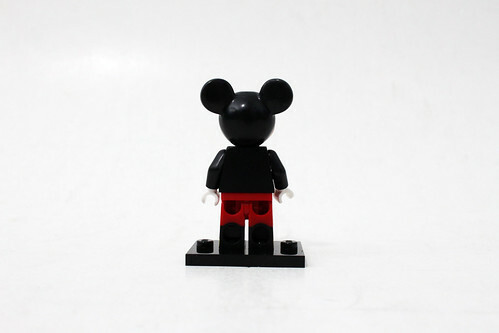 We can’t have a Disney Collectible Minifigures series without the character that started it all, Mickey Mouse. 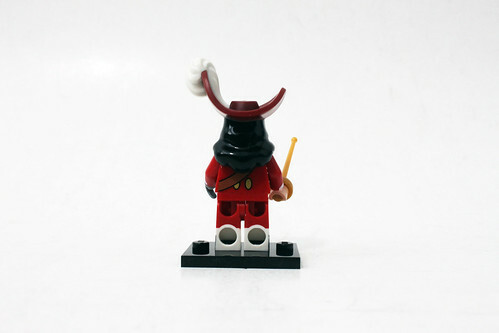 The minifigure itself is pretty simple with the look that we’ve been used to seeing. The torso is all black except for the white hands for his gloves. The legs have printing for his red shorts with white buttons as well as his yellow shoes. 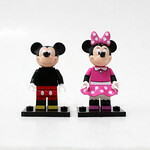 Mickey’s head is similar to Minnie’s as it has him with a closed mouth smile. 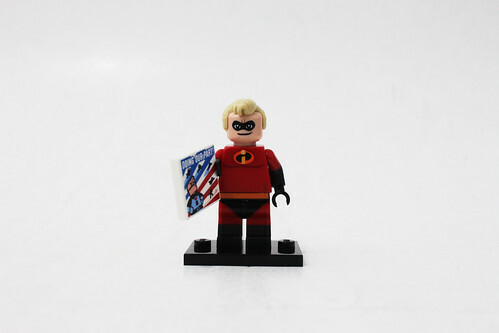 The Incredibles franchise is also represented in the Disney Collectible Minifigures series with one of the main characters with Mr. Incredible. He has on the red suit that the Parr family wears with the logo prominent in the middle of the chest. The head has printing of the black mask and a slight cocky expression. I believe the blond hair piece is new. Mr. Incredible’s accessory is the “Doing Our Part!” poster that was seen hanging on the wall in the movie. 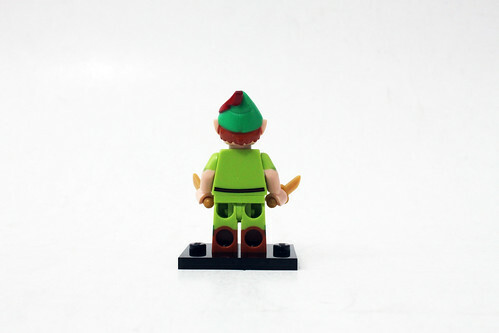 One problem I have with this minifigure is that the proportions on the torso are off since he has a wider upper body and that’s impossible to recreate in minifigure form unless a new mold is released. Syndrome is an interesting character selection for this series. He’s not a very well-known Disney character and there are plenty others that could have easily replace him. 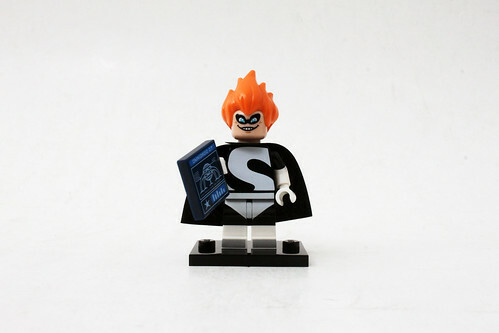 He wears the black and white costume with the “S” going down the whole torso and part of the legs. The arms do have printing for his gloves. He also has a black cape to complete the costume. 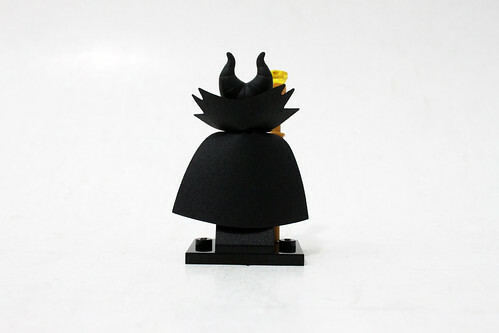 Since the character has a huge chin, the head piece doesn’t translate that well even though the printing has a larger bottom portion. I do like the large orange hair piece which can be used for other creations. 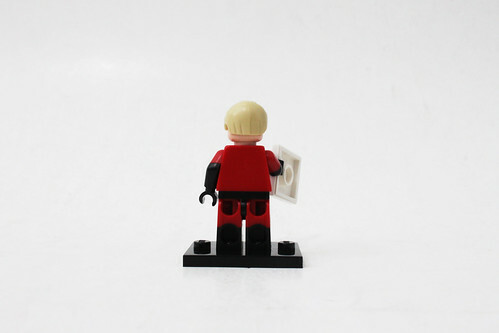 His accessory is a printed 2×2 tile of the Omnidroid 07. 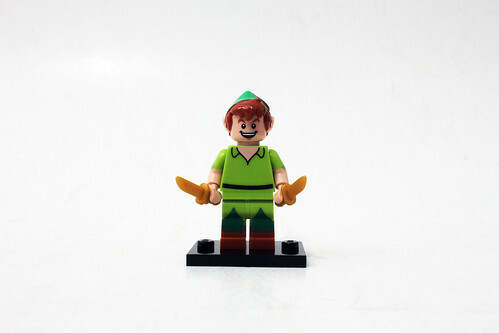 Peter Pan also makes an appearance as a LEGO Disney Collectible Minifigure. He has his typical green outfit that we’ve seen him wear the movie and TV shows. The torso has printing of his brown belt around his waist. The sleeve printing on the arms have some non-even cuts which is nice attention to detail. Speaking of detail, the legs are also great with cuts to the lower part of the shirt and the shoes. Peter has a very happy expression that captures the character very well. The hair/hat piece also has the pointed ears molded on to it. The hat also has a red feather molded to the top of the hat. His accessories include two short daggers which are pearl gold instead of gray as shown in the insert. 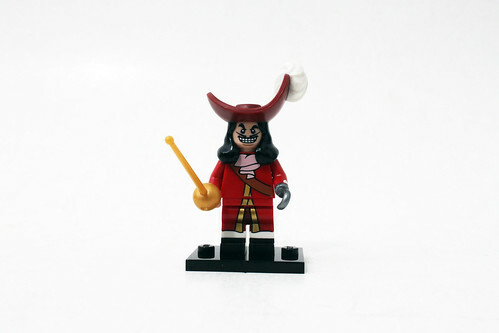 Of course you can’t have Peter Pan without his arch-nemesis, Captain Hook. 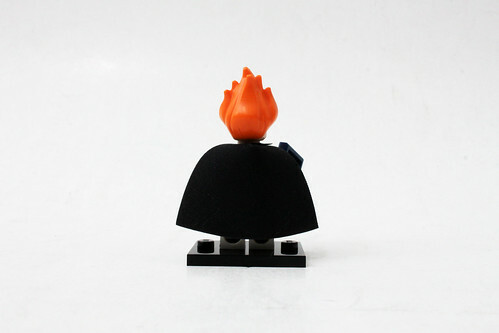 He wears a crimson red coat with some gold lining that goes down to the legs. There’s also printing of the white frill cravat as well as the sash that can also be seen on the back of the torso. The left hand is replaced by the iconic silver hook. The face has printing of his thin moustache and evil smile. The only thing that’s missing on him is the hook nose. The hat/hair piece is fairly large with a white feather molded on it. Finally he has a gold rapier as an accessory. 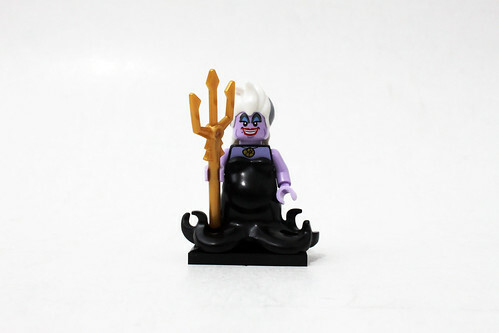 One of the popular minifigures that I’ve been reading about is Ursula from The Little Mermid. She has a lavender skin tone on the torso and head. The rest of the body is the black octopus tentacles. If you look closely, you can see there’s a rounded shape to that piece to show off her plump appearance of her lower body as well as having only six tentacles. Ursula’s face is really detailed with the eye shadow above the eyes and large smile. 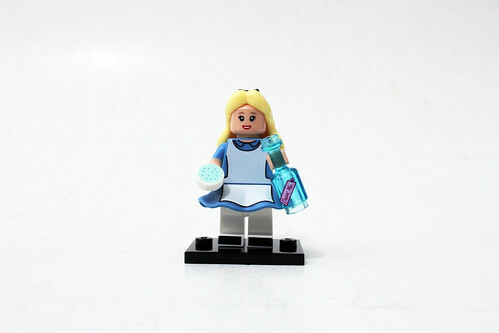 There’s also a beauty mark on her right cheek which again shows how much detail LEGO put into these Disney minifigures. To finish off her look, she has the large white hair with some gray/silver on the sides. Her accessory is the Trident. 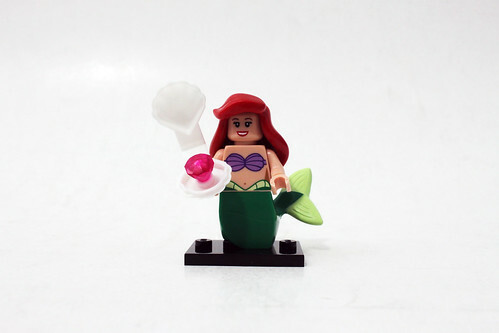 Ariel from The Little Mermaid is the first character to be made in both mini-doll form with the Disney Princess sets and now in minifigure form in this set. The torso is pretty much spot on with her purple seashell bra. 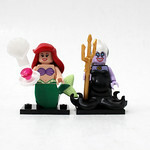 The tail piece has been used before with previous Mermaid-type minifigures. 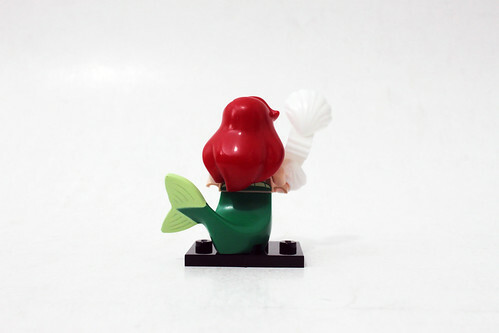 The version on Ariel is mostly dark green with a lighter green on the fins. Another thing that stands out for Ariel is her new, long red hair. Her accessory is a clam with a pink jewel inside which is okay but I would’ve preferred Flounder or Sebastian. 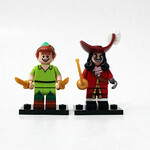 Overall, I was actually really surprised that LEGO released the Disney Collectible Minifigures (71012). There were quite a few characters that I really liked such as Stitch, Buzz Lightyear, Maleficent, and Donald. However, there were also some that really didn’t hit the mark for me like Mr. Incredible, Syndrome, Captain Hook, and Genie. The main reasons for that is because the characters just didn’t translate well in minifigure form. Some of those characters have larger features that didn’t come out too well the way they currently are. One thing that is neat about them as a whole is that they are all paired together whether it be with Mickey & Minnie and Donald & Daisy to movies like Aladdin, Alice in Wonderland, Peter Pan, The Incredibles, The Little Mermaid, and Toy Story. 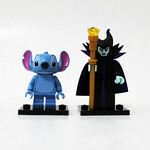 The only two minifigures that didn’t have a corresponding character with Stitch and Maleficent. You may also have noticed that there are a ton of notable Disney character that weren’t in this series like Goofy, Pluto, Simba, Pinocchio, and more. There could be various reasons why they weren’t included but the obvious one is that they were held off for a future series. 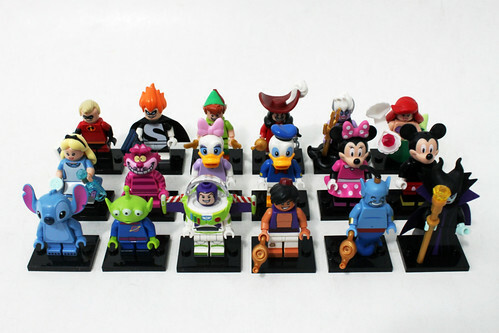 Of course this is just speculation but don’t be surprised if there are more Disney Collectible Minifigures released in the future. 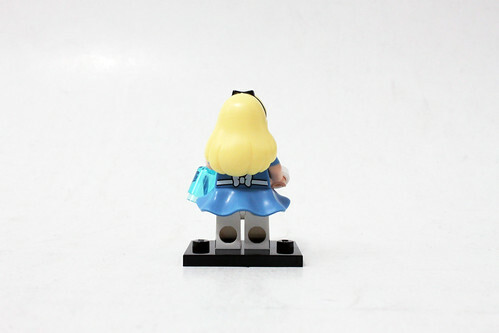 There’s also a rumor that there will be some updated and new minifigures included with the Disney Cinderella Castle (71040). Other than that, I think the Disney series as a whole is fantastic. Judging by early reactions, these are very well-received by the community. 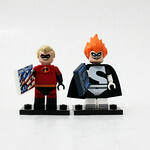 A majority of the minifigures are iconic characters from animated film history and to have them as minifigures is just awesome. 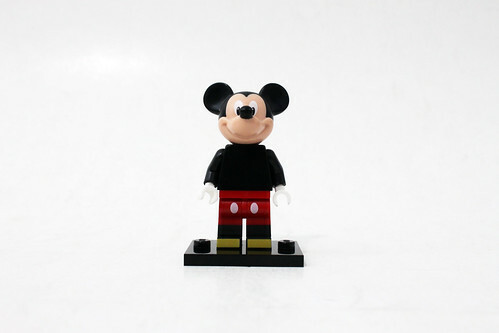 The LEGO Disney Collectible Minifigures will be widely available starting May 1st for $3.99 each but I don’t expect them to stay on shelves very long as early as I can see general Disney fans wanting to gobble them up as well. If you’re searching for them, make sure you check out the feel guide that I posted a short while ago. 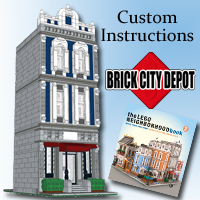 Thank you to the LEGO AFOL Relations & Programs team for sending in this set for me to review. The content above represents my own opinion and not the company.